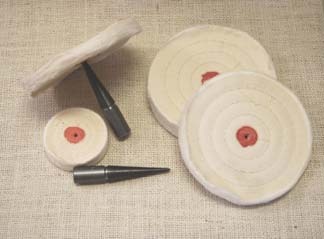 HUT™ Products offers a variety of Klingspore™ 1" wide sanding rolls and Magic Sand™ sanding sheets. Right-Hand and Left-Hand steel tapered spindles along with muslin buffs are also availible. HUT Crystal Coat™, a liquid friction finish, is regarded by many as one of the best wood finishes availible. Original HUT Dark™ gives a satin finish to darker woods, and HUT Lite™ gives a satin finish to lighter woods such as maple, birch and pine without darkening their color. HUT Perfect Pen Polish™ (PPP) Satin Gloss is formulated specifically to give a satin gloss finish to Pens and other small wood projects. HUT Perfect Pen Polish™ High Gloss is formulated specifically to give a high gloss finish to Pens and other wood projects. HUT Ultra Gloss™ gives plastic a glass like shine in seconds.